Cuz you don't need to check the fare and buy the ticket every single time you ride a train. You can also use it for shopping, so you don't need to search your pockets for coins. It's worth getting it even though you are staying for a couple of days. Suica and PASMO are the IC cards you can buy in Tokyo. What's the difference? Nothing really. Suica used to be only used for JR railways and PASMO was for subways. However, JR and subways runs all complicated in the city, and they changed the system a while ago. Note: There are many different JR IC cards depending on the area, other than Suica like ICOCA(JR West), TOICA(JR Central) and so on. But don't worry. 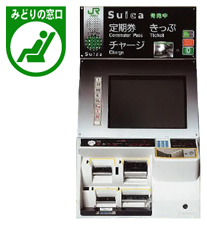 You can use Suica/PASMO outside of Tokyo area. Just as Suica and PASMO, they changed the system for frequent domestic travelers that you don't have to switch different cards for each areas. Both types of IC cards can be purchased at Narita and Haneda Airport. I recommend as soon as you arrive in Japan! You can get it from the ticket vending machine at the station. Note:Both cards cost ¥500 deposit at the first purchase, but it will be refunded when you return the card. You can charge up to ¥20,000 at the ticket vending machine with the IC sign on the left, or a charging machine before the gate. Just tap it before you go in to the ticket gate and also before go out. Don't go thru if the red light goes on. You have to talk to the station staff to erase the card memory and they will ask you where you really get off. It'll be a bit of hustle for visitors who doesn't speak Japanese. Note: No need to take it out of your wallet when you tap it.